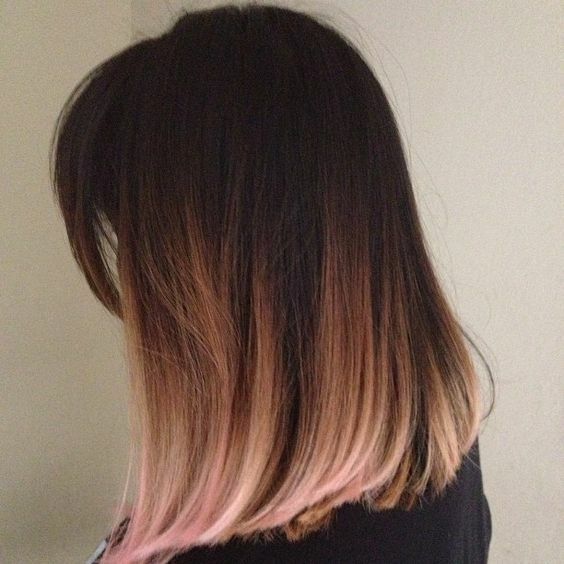 Ombre and balayage styles have been popular for several seasons, proving that the two-toned color trend is beyond a passing fad. 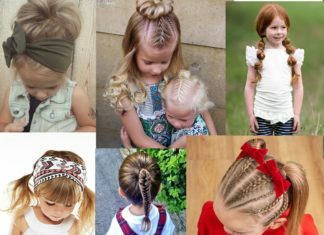 One of the best things about these looks is that they can work for almost any hair color or length, but blonde ombre styles continue to be the most popular and versatile. 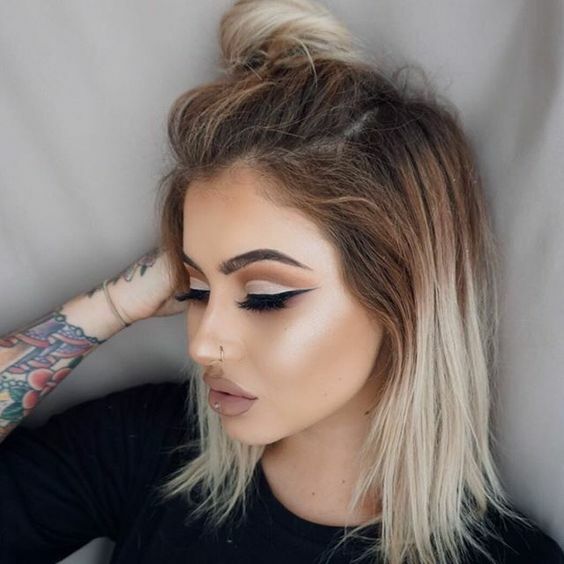 Whether you’re looking for a high contrast ombre over a chocolate brown base, or just a splash of platinum at the ends of your dirty blonde hair, blonde ombre will brighten up your locks and refresh your look with no cutting required. 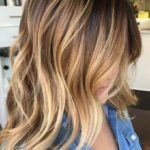 As with any style that involves lightening your hair, this color process can be damaging to already fragile ends, and it’s best to consult a professional about the best way to make your ombre dreams a reality. 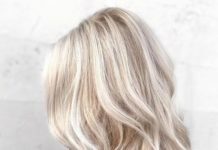 If you’re looking for more inspiration to lighten up your ends next season, take a look at some of our favorite blonde ombre hair ideas. Since she went blonde in 2015, Khloe Kardashian has been setting trends with every new cut or color she wears. 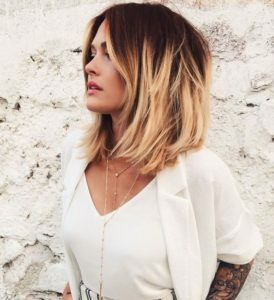 These blonde ombre lengths with a slightly darker base color are one of the best examples of just how sophisticated the color trend can look. 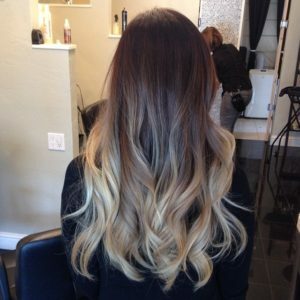 This blonde ombre style creates a bold contrast between golden blonde ends and a natural ashy brunette base. If your blonde ombre starts higher than your chin and will be right against your face, consider your skin tone when choosing a shade of blonde. Warm golden tones tend to look best against medium or dark skin, while fairer complexions can handle very light platinum tones. The warm, rich tones in Emily Blunt’s honey colored ombre help to bring out her peachy cheeks. 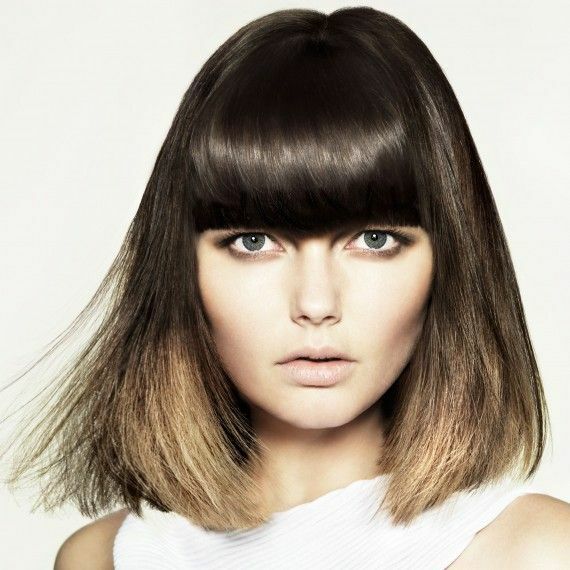 Try this style out if you’re looking to transition your brunette shade for a new season. 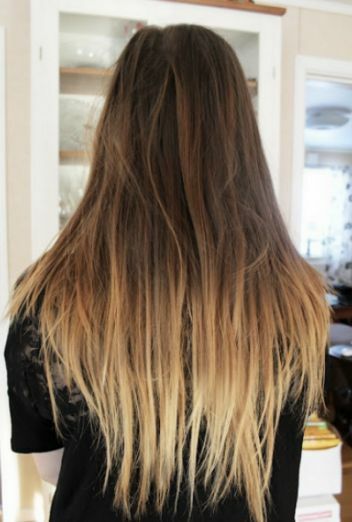 If you’re looking for a blonde ombre hair color that’s decidedly unnatural looking, try going for a dip dye style. 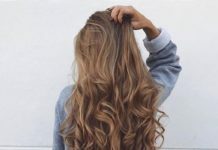 Just as simple as it sounds, this technique involves dipping the ends of your hair in a new color, and doesn’t involve any blending or graduated color. Try this ombre style at home, or head to the salon if you’re looking for a blonde dip dye that’s perfectly even all around. 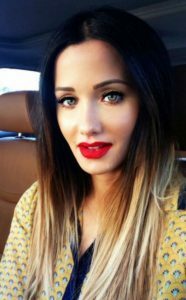 Longer hair allows more room to play with ombre colors, and you don’t have to be as concerned with how the blonde tone will look up against your face. Jessie J uses this to her full advantage, framing her face with the striking espresso color that makes her eyes pop, and using a honey blonde color on the lower half of her hair. This transition from dark blue-red at the roots to golden blonde ends makes for a bold, fiery color palette. Red tones are among the hardest to keep from fading away, so this style will have you thinking about aftercare both in terms of keeping your bright red from fading, and nurturing ends that may be dried out in the bleaching process. 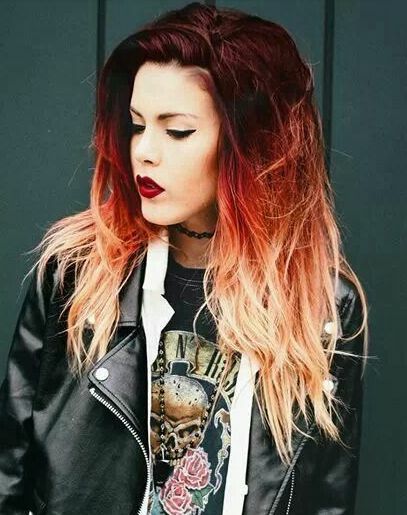 While dip dye ombre usually features a bold contrast between two shades, this look uses a darker honey blonde that isn’t dramatically lighter than the rest of the hair. If you’ve got long ombre hair that’s in need of a chop, you might be able to achieve this look without any color touch up at all. 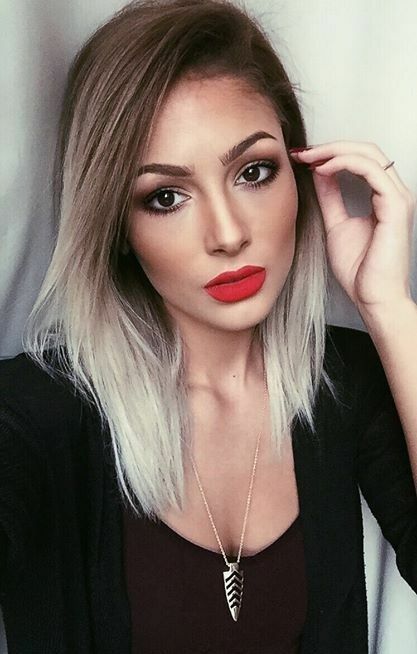 This style strikes a nice balance between the eye-catching color dynamic and the natural, ashy look of both roots and ends. Natalie Portman’s subtle blonde ombre is most obvious when hair is styled straight, but you can downplay the contrasting color by wearing hair in waves or curls. As if this peachy pink hair wouldn’t be bold enough on its own, this look sees it combined with a strawberry blonde ombre. This is a great way to shake things up if you love ombre hair but want something funkier than a blonde and brunette combination. This platinum ombre is about as light as blonde shades come, making for a bold statement when combined with rich espresso hair. If you can’t decide on one warm shade to wear your hair in, try this high contrast dip dye with warm golden blonde over chocolatey brunette. 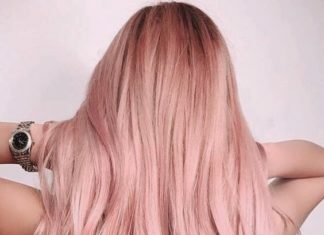 If you don’t want to see a solid line between colors when hair is worn straight, dip dye in small pieces and each will end up at a slightly different height. Not only does this blonde ombre help a red bob to look even more bold, but the bleaching process can actually plump up the ends of hair. 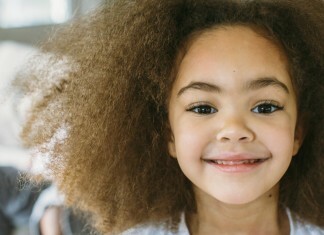 If your ends are damaged, we’d recommend giving hair a break before lightening, as this can make them split even further. This blonde ombre style is ultra chic, and features platinum ends over a cool medium brunette. 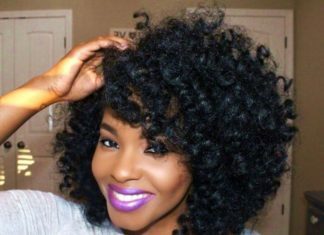 Because this look features two different colors right up against the face, it’s important to consider how each shade will play against your skin tone. This blonde ombre hue looks surprisingly sophisticated in combination with Vanessa Hudgens’ nearly black roots. 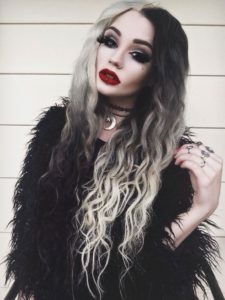 When paired with dark clothing and gothic-chic makeup (think dark berry lips and smudgy black liner), a blonde ombre adds warmth and dimension to the look. 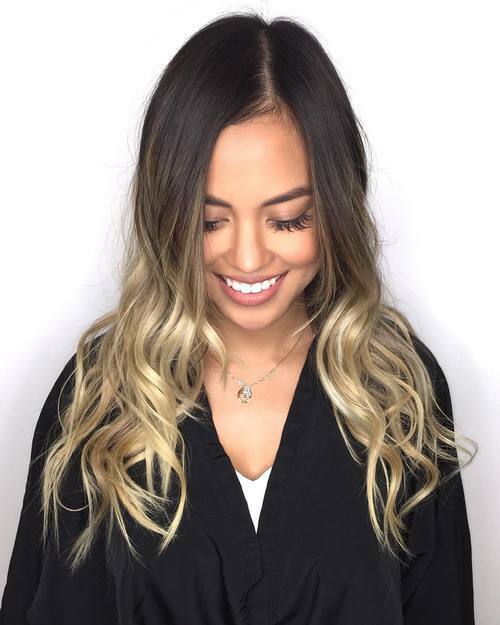 If you’ve been blessed with hair that’s naturally auburn in color, blonde ombre is the perfect way to reinvigorate your hairstyle without an all-over color makeover. 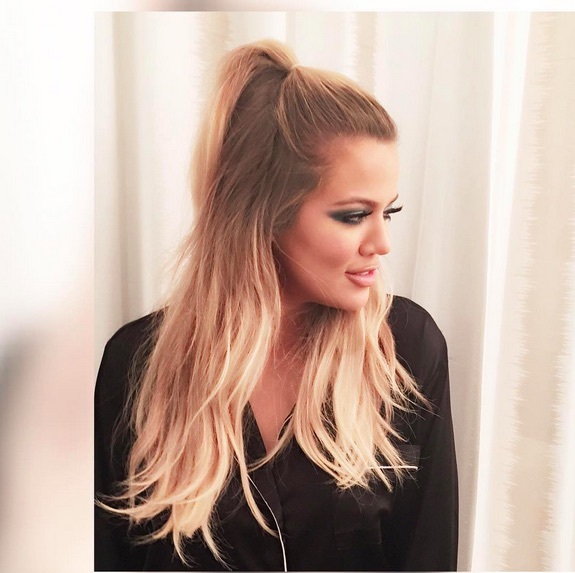 This blonde ombre over a black base color is about as bold as you can go. 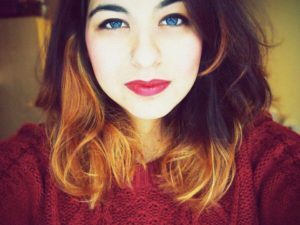 If you’re trying to lighten dark brown or black hair, applying a toner after bleaching is usually necessary to keep things from looking orange or brassy, and this high-stakes ombre job is best left to a professional. 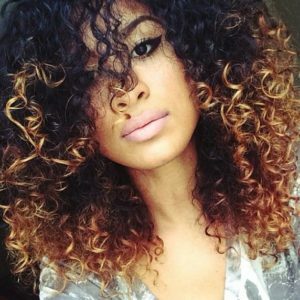 Blonde ombre is a great way to punch up curly hair, whether that means chemically lightening your natural curls, or installing ombre dyed hair for a crochet braided style. This summery style layers light blonde ombre over Lauren Conrad’s signature shade of dark sandy blonde. 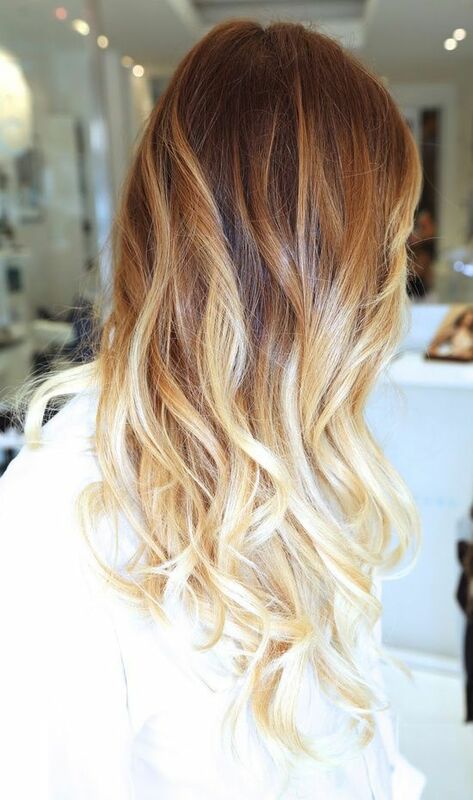 The two-toned blonde effect here makes for a more subtle but sunny ombre style. This golden blonde ombre over dirty blonde hair makes for a bold look that’s perfect for warming things up in the summer or when you’re looking to do some color experimentation. If you’re looking for a bold fusion of edgy and beachy hairstyles, try this cool brunette with thick bangs paired with a warm blonde ombre. This bob with a hint of blonde ombre is quite a change of pace for Katharine McPhee, who usually wears her hair long and dark. Unlike a dip dyed bob with a bold contrasting color, the blonde ombre here very subtle, and mostly concentrated around the face. Another lovely example of blonde on blonde ombre, this style features a nice gradual transition from a sandy shade at the roots to pale platinum pieces throughout the ends. 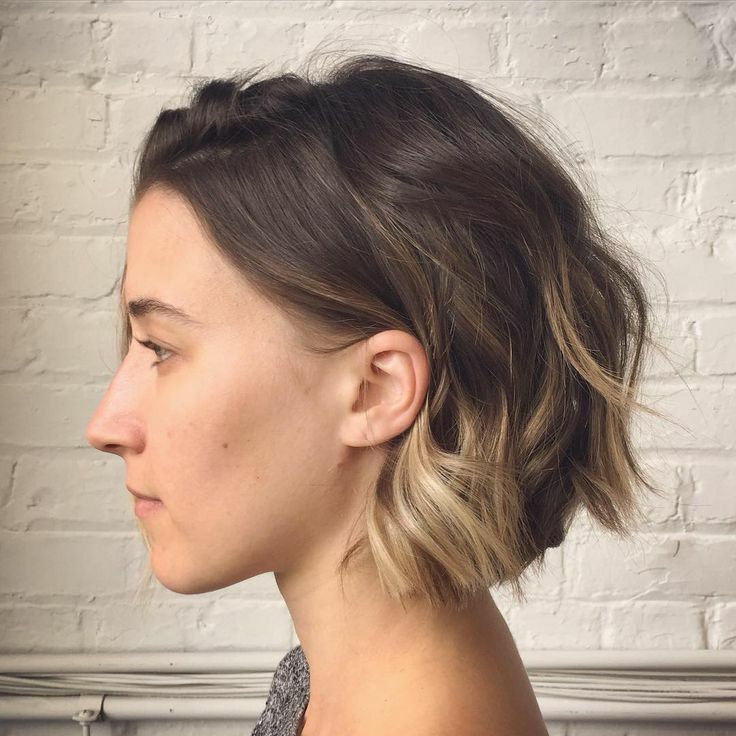 One of the most natural looking styles on our list, this bob has subtle touches of blonde ombre that expertly mimic sun-kissed highlights. Try this style out if you’re looking to add some dimension to your bob without feeling like you’ve gone overboard. A pale blonde ombre brightens up this warm auburn style, and keeps things interesting even when hair is thrown into a casual, half-up style. In a very goth-chic color twist, this style uses black and platinum blonde hair to create a unique half-and-half ombre. 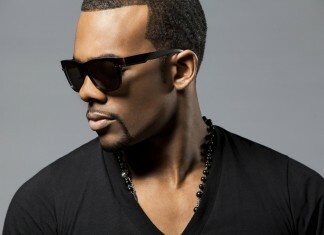 Try this one out if you love attention and are looking for an incredibly bold color style. 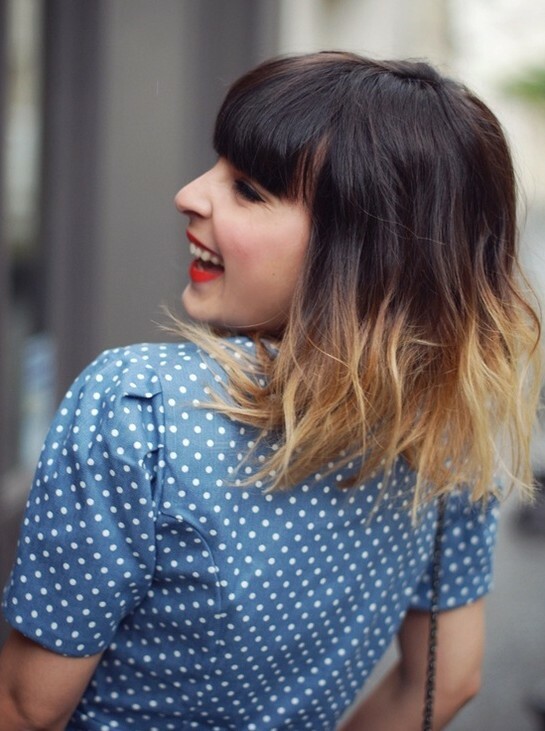 We love how brazen this blonde ombre looks over dark brunette hair with thick bangs. 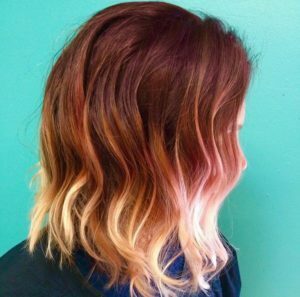 Looking like the perfect union of our favorite elements of winter and summer styles, this rich ombre will make the perfect addition to your fall or spring style. 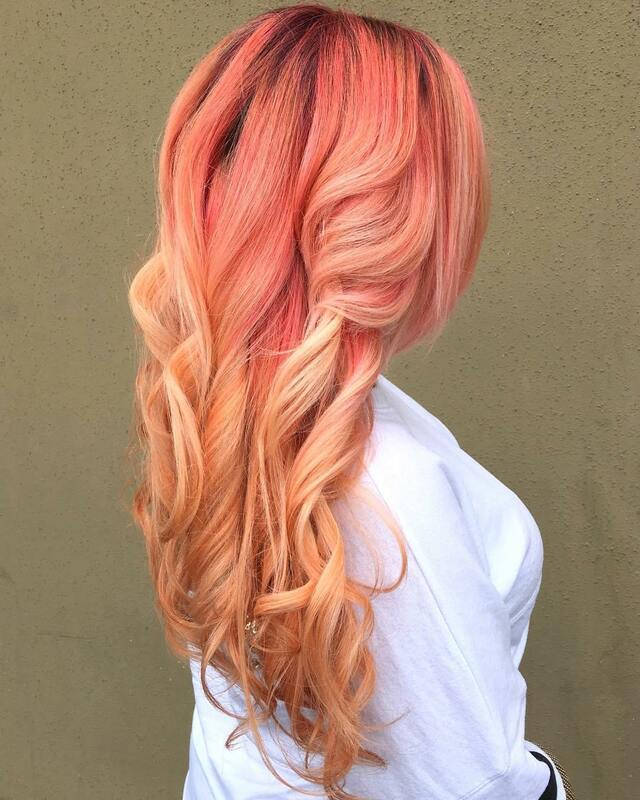 The pink-blonde ombre on this mid-length cut looks like strawberry lemonade, and could be an appropriate choice in any season thanks to the bold contrast between light and dark shades. One of the perks of growing your hair insanely long (or wearing extensions), is that you have tons of room to experiment with ombre color. 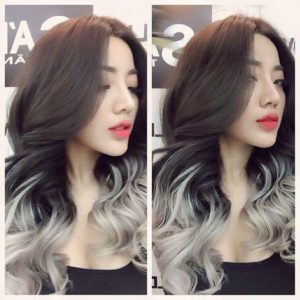 This platinum ombre will freshen up your ultra long locks without sacrificing any length, and makes for even prettier french or dutch braided styles. This high contrast blonde ombre begins quite far up the hair’s length, and could almost be mistaken for color that’s grown out at the roots. 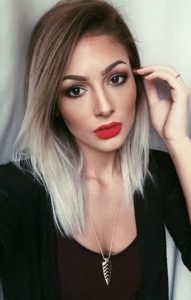 Some face framing pieces of blonde that begin higher up help to add a sense of purpose to this bold, rule-breaking blonde ombre.